Few Amish are found in the West, and like other states in the region, Plain settlement in Oregon has been limited. While no Amish call the Beaver State home today, numerous sellers of their products can be found in the state. Residents of Portland, Eugene, Salem, Gresham, Hillsboro, and other cities can find retailers of Amish-built home decor within easy reach using the directory below. Furniture from 3 dozen+ Amish wood workers. Wide range of styles, Amish oak furniture and many other woods available. Custom-built pieces available. Diverse range of items includes hutches, kitchen islands, desks, cradles, bookcases, cedar chests, high chairs, jelly cupboards, sideboards, coffee tables, outdoor furniture, armoires, gun cabinets, magazine racks, nighstands, dining nooks, and much more. Woods available: Cherry, Oak, Quartersawn White Oak, Rustic Cherry, Maple, Brown Maple, Lyptus, Walnut, Elm, Hickory. Three Oregon locations including two in the Portland vicinity. Featuring a line of Amish furniture from Midwest craftsmen, including beds, dressers, chairs, TV entertainment centers, plasma stands, desks, computer centers, office chairs. Variety of wood grains available. Two Oregon locations–Eugene and Bend. Dining rooms, bedrooms sets, bookcases, chests, desks, occasional tables, hickory rockers, more. Crafted by PA Amish wood workers. Northern white pine, cherry, cedar, hickory, red oak among woods available. Also sells cherry rockers and cherry gliders. Amish-made office furniture, hutches, cabinets, dining rooms, living rooms, kids’ furniture, armoires, breakfast nooks, mirrors, pie safes, etc, from Holmes County, Ohio. Amish and Mennonite furniture as well as non-Amish lines, in Portland. Non-Amish furniture lines with a selection of Amish pieces. Amish furniture items include bookshelves, cabinets, office furniture, occasional pieces, more. Convenient location west of Portland. You can also try our dedicated guide to Amish Furniture in Portland, Oregon. To find Amish furniture dealers beyond Oregon, check the Amish Furniture directory main listing, an extensive directory of Amish woodworkers, furniture retailers, and showrooms in the US and Canada. Note to Oregon residents: Please be sure to check opening hours of any Amish furniture businesses listed in this guide before traveling long distances. While we strive to keep this directory up-to-date, business locations and schedules can change. Not responsible for changes to information. Do Amish people live in Oregon? No Amish live in Oregon today, though at one time they could be found in the state. Amish settled in Oregon in the late 1800s on at least a pair of occasions, in the areas of McMinnville in Yamhill County, as well as Linn County. 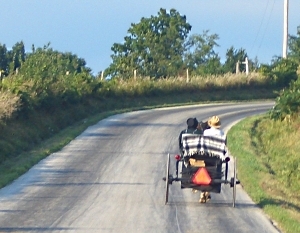 The Linn County group originated with Amish from the Arthur, Illinois community. This settlement turned out to be short-lived, lasting about a decade before extinguishing in 1907. The McMinnville Amish settlement was formed by Amish from the Linn County community (see GAMEO “Linn County, Oregon Amish Mennonite Settlement” and “McMinnville, Oregon, Old Order Amish Settlement”). Today no Amish live in the Beaver State, likely due to a number of factors, including distance from other Amish settlements. Will an Oregon Amish community one day exist? Amish have shown their willingness to migrate throughout their history in America. In recent times Amish have moved from Eastern communities to the West, settling in areas they have never lived before. With the high Amish rate of growth, and willingness to move, perhaps “Oregon Amish” will be a term heard once again. Amish furniture making has enjoyed a burgeoning reputation. Though Amish have long focused on agriculture, increasing land prices and growing market demand have funnelled Amish men into the furniture trade. 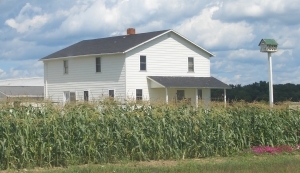 Setting up a small shop is easier than purchasing a large dairy farm, and allows many Amish families to maintain an at-home trade which can involve the whole family, in some ways similar to the farm. Amish produce nearly every style of furniture for each room of the house, including the kitchen, bathroom, living room, bedroom, dining room, children’s room, as well as outdoor furniture. Some Amish specialize in kitchen cabinets, custom-crafting them to their client’s specifications. Other Amish produce a standard line of furniture to sell wholesale to non-Amish dealers, or in some cases retail, direct to the public. Amish craftsmen are adaptable and able to make a wide range of furniture styles, even contemporary ones. Even though they wouldn’t use much of this “fancy” furniture in their own homes, they have no problem with making it for the public. Where to buy Amish furniture in the Beaver State? Some would-be Amish furniture buyers prefer to visit the shop itself, to meet the Amish owner and craftsman and decide on a style and material for their furniture. With the nearest Amish to Oregon being many miles away (Montana), this would require a long journey for Oregon residents. Alternatively, Oregonians can visit one of the many Oregon Amish furniture showrooms, typically featuring a wide selection and offering the added convenience of being close to major population centers like Portland and Eugene. Finally, Oregon citizens may order Amish furniture online, with internet retailers typically offering delivery of Amish furniture to Oregon and the rest of the continental US. We moved recently and the movers managed to mar the wood framed sofa by running it along the door jamb. Any recommendations on a refinisher? Terri, unfortunately there aren’t any Amish living in Oregon at present. It sounds like it might make more sense to find a local non-Amish refinisher?